When this time of year rolls around, it seems like everybody is on a quest for the perfect roast turkey. Thanksgiving wouldn’t seem complete without a gorgeous, golden turkey on the buffet. To our modern perspective, turkey and Thanksgiving are inseparable, but in reality, this tradition didn’t begin until the eighteenth century. The first Thanksgiving celebration in 1621 featured roast deer, duck, and other waterfowl– no turkey. While not much is known about the earliest Thanksgiving dinners, a few descriptions have survived. According to the Oxford Companion to American Food and Drink, “one description dated 1784 mentions drinking and eating in general and implies that pigs, geese, turkey, or sheep were served.” It seems that if you’re wanting a historically accurate Thanksgiving meal, turkey is optional. But that won’t stop most Americans from serving a turkey at their Thanksgiving feast. Today, I thought I’d share with you the roast turkey that I make every year for Thanksgiving. I can’t claim credit for the original version of this recipe; it was created by Alton Brown from the Food Network’s show Good Eats. Alton’s roast turkey recipe is wildly popular, with good reason. I’ve been making and adapting this turkey recipe for the past four years. Each year, I make a few adjustments to the aromatics and the brine. Today I’m sharing with you the version I made last year, which was terrific. The brining and cooking process is basically foolproof, as long as you plan ahead and make sure your turkey is defrosted in plenty of time for an overnight brine. 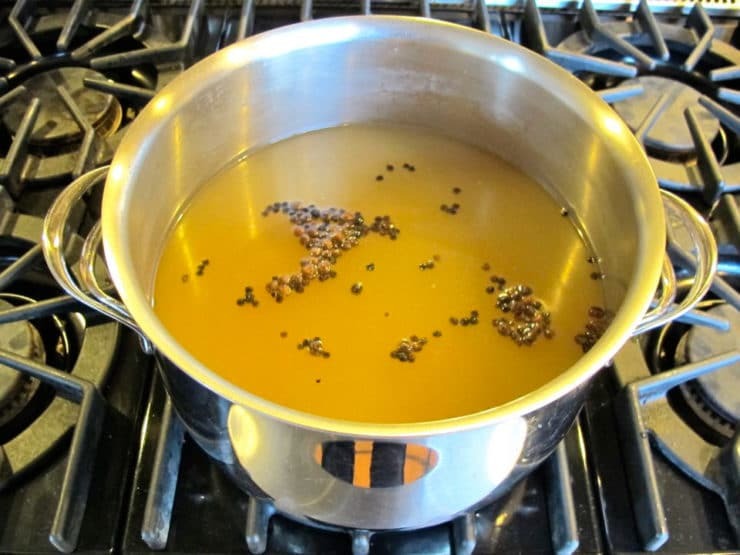 The brine is important, particularly for the breast meat– it adds moisture and flavor to the turkey. So don’t skip it, even if it seems like a lot of work. It’s actually a simple process, as long as you have some upper arm strength to heave that turkey in and out of the brining bucket. Alton’s directions are pretty clear; I’ve provided step-by-step pictures to keep you on track, and given more details where needed. I have taken a few liberties with Alton’s original recipe, changing the spices in the brine and adding herbs and garlic to the aromatics. Creativity is half the fun in my kitchen. If you’re using a kosher turkey, the meat will already be soaked and salted, so you do not really need to brine it at all. If you want to brine a kosher bird then cut way back on the salt (or eliminate it completely), since the turkey meat will already be salty. I usually choose an organic un-brined bird, not kosher, and brine it myself. Even if you’re using a kosher bird, you can still use the aromatics and roasting method outlined below– just skip the brine! Alton suggests heating the meat to 161 degrees… I usually take it out at 165 degrees. Don’t let it heat above 165 or the breast meat will start to dry out. Other than that, everything should be pretty self explanatory. A lot of people are afraid of roasting turkey, particularly those that have never done it before. Never fear! If this is your first time cooking turkey, this tutorial should keep you right on track. Enjoy! 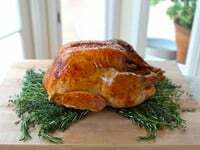 Adapted Recipe for Alton Brown's Roast Turkey; a classic, aromatic, moist roast turkey with step-by-step photos and instructions. Kosher, meat. 2 to 3 days before roasting, begin thawing the turkey in the refrigerator or in a cooler kept at 38 degrees F.
1 day before roasting, combine the vegetable stock, salt, brown sugar, peppercorns, allspice berries, cloves and ground ginger in a large stockpot over medium-high heat. Stir occasionally to dissolve solids and bring to a boil. Then remove the brine from the heat, cool to room temperature, and refrigerate. 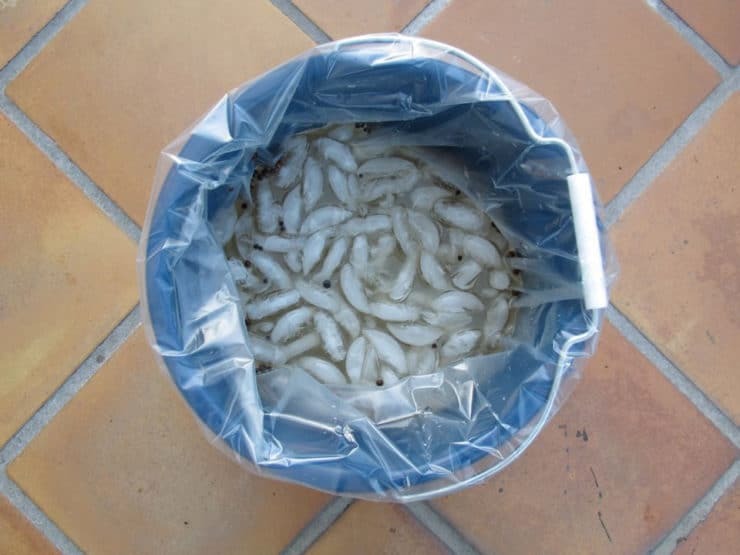 The night before you'd like to eat, combine the brine, water and ice in the 5-gallon bucket. I like to line the bucket with a brining bag that I can close up once the turkey is in; it keeps the turkey more evenly immersed. Place the thawed turkey (with innards removed) breast side down in brine. If necessary, weigh down the bird to ensure it is fully immersed. 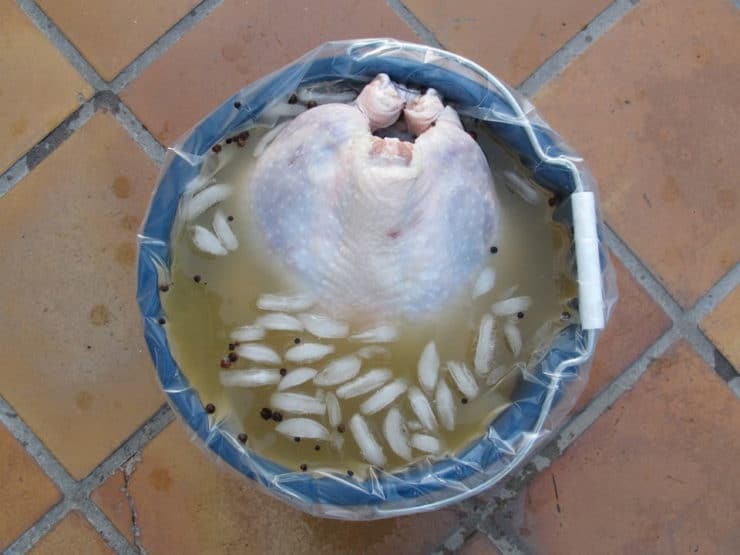 Cover the bucket with a thick towel or foil (or close up the brining bag) and refrigerate or set in cool area for 8 to 16 hours, turning the bird once half way through brining. Preheat the oven to 500 degrees F. Remove the bird from brine and rinse inside and out with cold water. Discard the brine. 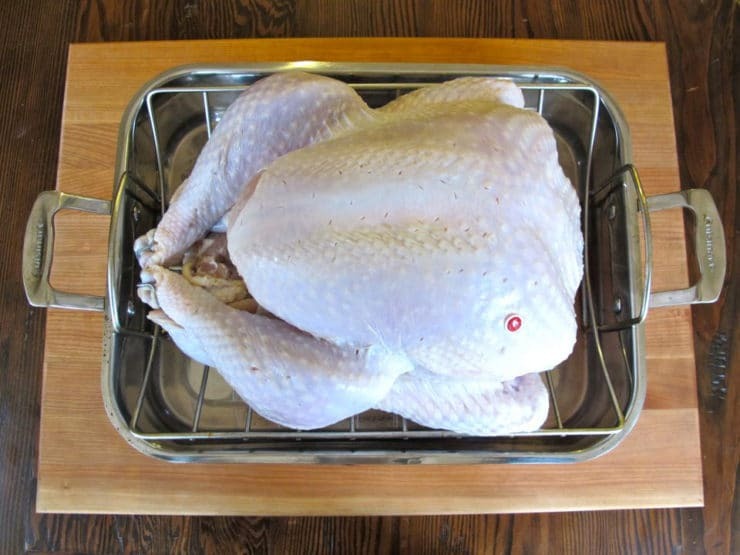 Place the bird on roasting rack in a roasting pan and pat dry with paper towels. If your bird has a popup timer inserted, leave it in (so juices don't leak out of the hole), but don't use it to measure the temperature-- use a probe or meat thermometer instead. These are more accurate; if you follow the popup your meat may turn out overcooked and dry. Also, your turkey should have a metal or oven-safe plastic band around the legs to keep it trussed. If it doesn't, truss the legs together with some kitchen string. Add steeped aromatics to the turkey's cavity along with the sage, thyme, marjoram, rosemary and garlic. Tuck the wings up and under the bird. Brush the turkey liberally with olive oil and sprinkle with salt and pepper. Roast the turkey on lowest level of the oven at 500 degrees F for 30 minutes, turning the roasting pan around 15 minutes through cooking to ensure even browning. 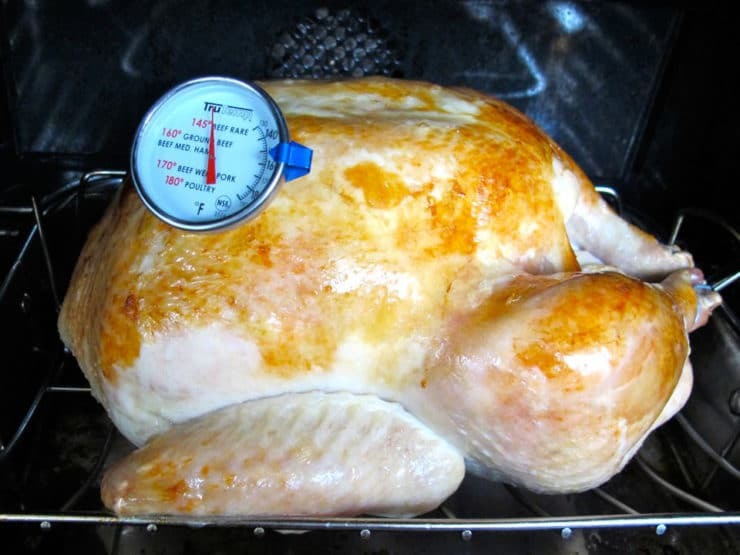 Set the thermometer alarm (if available) to 165 degrees F. A 14 to 16 pound bird should require a total of 2 to 2 1/2 hours of roasting. Turn the roasting pan around after about 1 hour of cooking to ensure even cooking. Let the turkey rest, loosely covered with foil or a large mixing bowl, for 15 minutes before carving. This step is very important; it allows the juices to settle into the meat, making for a moister turkey. 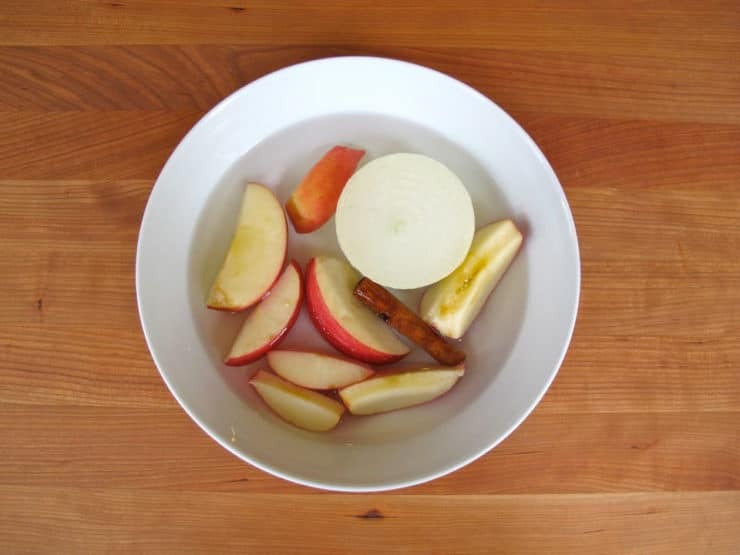 I use apple juice in place of the vegetable broth. It sweetens the meat just a tad. My family loves it. I used this recipe following it exactly last year and it turned out perfect.Definitely using it again this year . How would this be if I didn’t brine it? Used this last Thanksgiving for roasting my first turkey and it was so helpful. The turkey turned out amazing and I was so nervous about it before hand. Going to be using this again this year. Thank you for the help! So glad to hear that Kaia! We love this recipe. The best turkey ever!! Thanks so much for this recipe. 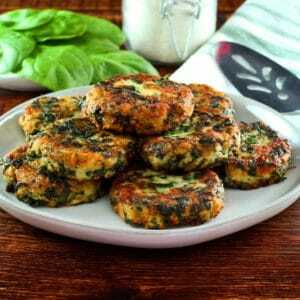 After many years of the same as my Mom, tried this for Thanksgiving and got rave reviews! Family said best ever. Now preparing another one for Christmas. Really! Followed this to the letter and it was outstanding. Keep those recipes coming! Thanks from a seasoned cook for a new approach! I’m very interested in trying a brined turkey. I have struggled in the past with getting a turkey satisfactorily done. This year I bit the bullet, financially and bought a Butterball. I don;t know if you are familiar with the brand, but it is injected with oil, and I find they usually turn out better.Sorry long message, my question is can I use this brining method with this type of bird as well? This is the best turkey ever! Thanks!! I have a small bird, about 5 lbs. I bout it just to try this recipe! How do you recommend I adjust cooking time to suit the size? I know it will take aprox. 1 1/2 hours to cook, but will it take less than 30 minutes to roast? Happy thanksgiving! Hi Rachael, sorry I was not online during the holiday weekend. You probably already figured out the answer to this, but if you check the package of most turkeys there are specific cooking instructions for various weights. Roasting time is the same as cook time. Hope you enjoyed it! hi! I’m making my first turkey this year. Would I need to make any changes to the time if I’m cooking in a roaster vs the oven? 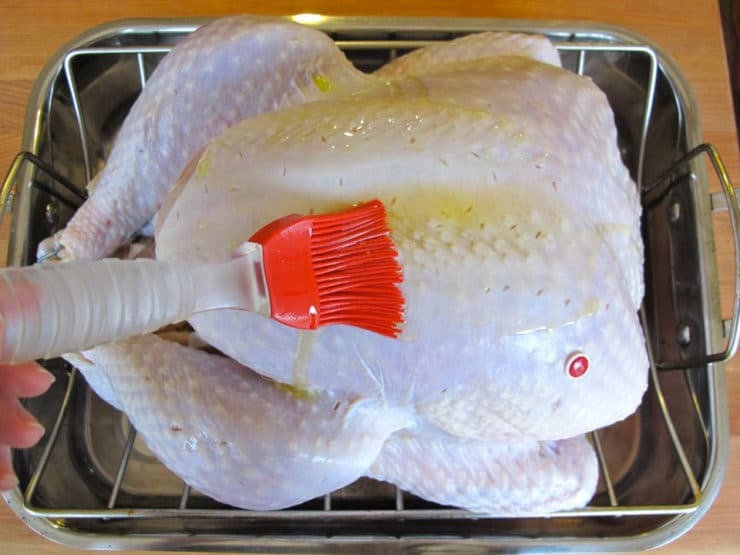 I’ve seen a lot of roaster recipes suggest putting water in the bottom to keep the turkey from drying out. Thoughts? Shayna, I don’t have a roasted so I’m not sure what to recommend. Hope the turkey turned out well! 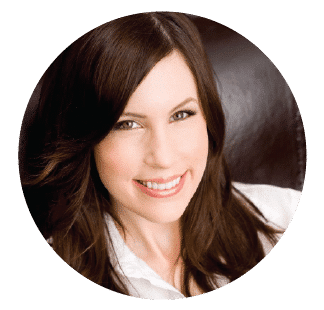 Hi Tori, I’ve come across this recipe and have all the ingredients and ready to go. I am excited to give this one a try and can’t wait to see the results. As I’ve read from another post with a 20-22 lb turkey is around 3 1/2-4 hours. I have a 24 lb turkey, so would I be looking to be around 5- 5 1/2 hours? Hope to here from you soon! 1. What role onion plays? Is it for keeping it moist? 2. 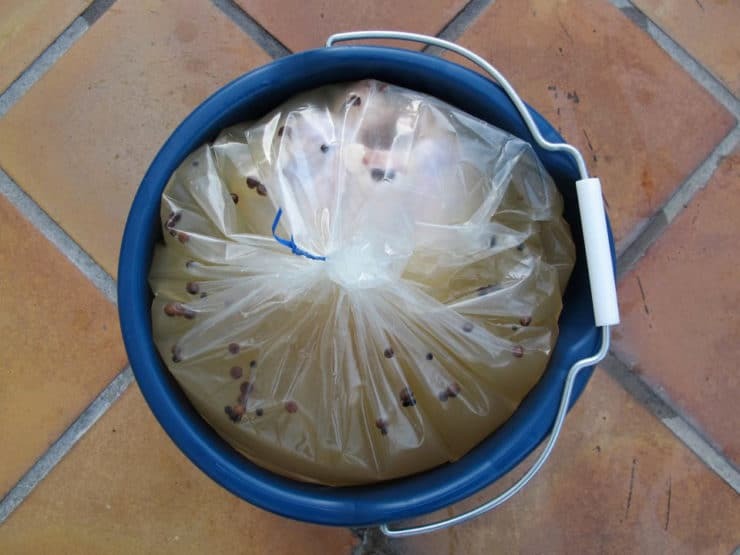 Would you advise (for or against) soaking apples in either wine or brandy before putting them inside the turkey? Hi Michael, the onion is there for flavor. Soaking the apples would be just fine. The more flavor/scent you can add to the aromatics, the better. I have made this turkey before and it is absolutely the best turkey I have ever had. I am going to cook a 10 lb turkey in 2 days and I was wondering how long to cook it. Thanks for your help! Hi Tori! Just wanted to say that I followed your turkey recipe this year and it was a total hit! Really turned out amazing and I love that it gave me time for other stuff in my oven after! Everything about it was perfect! Thank you so much for all your recipes! I also made the brussel sprouts with pomegranate molasses and they were great!!! Question about the turkey, I had to make 2 bc we had a large group and one of them was in an all clad pan the other in teflon. The one in the all clad started smoking like crazy, the other one a little bit but this one was out of control, is it the oil at the bottom of the pan? Is it too much oil or do I need to add water? For the time being I added a little bit of water at the bottom of the pan and it helped but any suggestions? I gave my aunt in Chicago the recipe as well and she loved it! But she also had the same smoking issue, any ideas? Also, I have some people that really like soy sauce with their turkey is there a way to incorporate it? Maybe in the brine or do you think with the brushing of the olive oil? Last question and I think it is a stupid question but the apple etc that you microwave, you just put those in the cavity right and you don’t do anything with the water correct? I just want to make sure. Thank you for this amazing recipe!! And for all of your amazing recipes, so far have used many for various holidays and all have been raved about! The recipe looks fantastic! What changes must be made if you are stuffing the turkey? Happy Turkey Day & Chanukah! What would be the total cooking time for a larger Turkey? I have ordered a fresh kosher turkey weighing 20-22 lbs. Hi Larry, sorry I didn’t get back to you before the holiday. The cook time for a bird of that size will be between 3 1/2 and 4 hours. 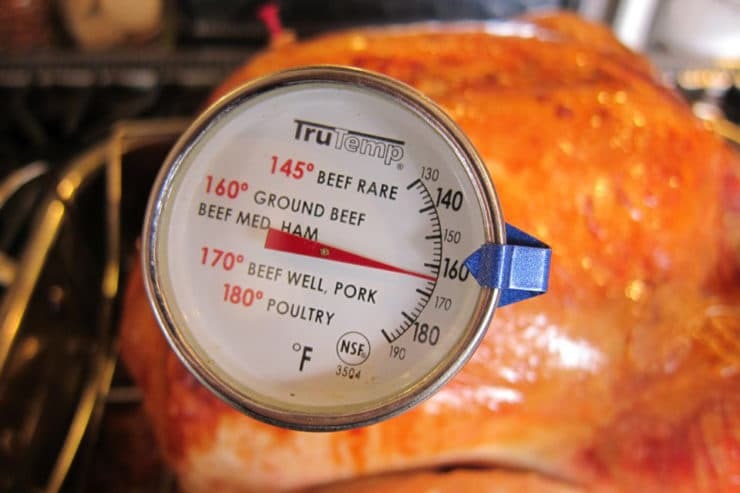 When a thermometer inserted into the thickest part of the breast reaches 165 degrees F, it is done. Also, remember that when preparing a kosher turkey you won’t need to brine. When you say ” turning the bird once half way through brining.” do you mean turn it over (breast side up) or rotate it around with the breast side always down? I amalways concerned about over-salting a kosher turkey. Can you please advise how much salt and pepper should be sprinkled on the outside of the turkey? Happy Thanksgiving from our family to yours. My family wants me to tell you thank you for this instructions, They did it exactly like you said and it was delicious, we had so many complements about it. They were so proud of it. So thank you, it was a success! Beautiful bird. Love your pictures. Happy Thanksgiving!!! Today I followed your recipe for the roast turkey and it was The Best one I have ever cooked – juicy and flavorful. Thanks a bunch. Happy Thanksgiving Tori! I was wondering if you could brine other poultry like chicken, duck or goose? Goose is pretty fatty already, so I don’t know if brining would be a good thing. What do you think? Beautiful bird Tori…I am not a briner by choice but your turkey looks lovely and your pics are wonderful. I wish you and yours a very Happy Thanksgiving! This is my favorite holiday! Do you have to use a Kosher turkey??? Thanks for the great recipe!!! Kay, no, you do not need to use a kosher turkey unless you are keeping kosher. You’re very welcome! What a beautiful turkey! I brine my turkey and grill it on the Weber kettle charcoal grill and it’s a huge success every year. I’ll have to try your brine. 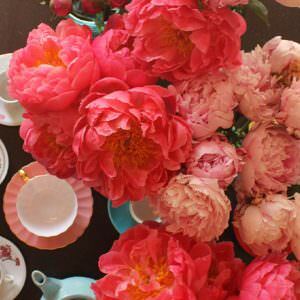 This looks absolutely wonderful, my dear! I am a sucker for perfect roasting techniques. I just bought my first roasting pan last night 🙂 Made a roast chicken today. I should do some brining with it! Thanks for the wonderful tips and pictures, Tori! So what time should I stop by? It is a fantastic recipe! Happy Thanksgiving! This looks like the perfect turkey! The brine must give it such great flavor!